In your childhood years, have you ever sat down at the kitchen table with a pencil and a clean sheet of paper to draw your own F1 dream machine? We have, and Peter Connew must have done the same. But who would have dreamt he'd end up genuinely fielding the car in F1 Grands Prix? To make this Cinderella story complete, the car was built up in a lock-up garage and financed by Connew's own savings. The strange thing is: Connew never had a passion for F1. Up until his design he hardly ever visited a motor race, nor did his F1 adventure spark a flame for the sport. Connew got involved when a friend asked him to join him on a trip to the 1969 Italian GP. An apprentice draughtsman at a record-player manufacturer, he asked time off but this was refused. He resigned on the spot. Although the race brought one of the closest finishes in F1 history the Monza thriller didn't enthrall him. The sound of V12 engines did, however. 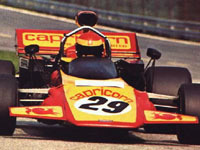 On his return he went looking for a job and a friend introduced him at Team Surtees, where Connew was appointed to redesign the in-board pick-up for the top rear wishbone of the TS5A F5000 car. "I hadn't the foggiest idea what they were talking about", Connew remembers in Classic and Sportscar (May 1984 edition). "but I asked around and everyone was helpful, so I stuck in." Then he describes what prompted him to build his own F1 machine: "At the end of the year, Surtees left BRM and began making the TS7 Grand Prix car. As a stop gap he bought Bruce McLaren's M7C which we had to modify with new fuel tanks to meet a change in the regulations. It was one of those bright clear February days when the car was wheeled out, freshly painted, for the first time. The car was in a gorgeous red and the sun caught it and I thought, 'I must build something like that'." The initial design was a traditional British kit car, built around a DFV engine and a Hewland gearbox, with a subframe carrying the inboard front suspension. The radiator setting was somewhat out of ordinary, though, and offered quite an ingenious solution to cooling problems. It was front-mounted at a very slight angle of five degrees, enabling air to pass through upwards and come out through a vent on the top. This also prevented turbulence underneath the car. The car was completely fabricated from aluminium, while several components were supplied free-of-charge by several benefactors. The crew consisted entirely of enthusiasts and volunteers, working all hours to finish the car, sometimes even giving up their day jobs to be ready for the 1972 season. The plan was to enter chassis PC1 at Kyalami but this proved to be too tight a deadline. But it wasn't their lack of experience slowing them down, it was the cash flow - or rather the lack of it - keeping them in roughly the same pace as their manufacturing tempo. The team now set their sights on Monaco, enabling them to do a proper job on the glass-fibre finishing. And a proper job they did. But then a sudden rule change forced them build another chassis, PC2, with a different kind of aluminium. In the meantime, the press had noticed Connew's progress, which had more people giving their support and even drivers like Howden Ganley phoning in. A friendly deal with McLaren saw Connew take home a DFV after having to take out the front seat of his car! Peter became involved in an argument with John Surtees, though, who accused him of lifting parts from his workshop after Connew had quit Surtees to concentrate on his own project. Connew got his driver - who cost him £ 2000 a race - though the brokerage of Brian Kreisky. It was François Migault, who went on to race unsuccessfully for BRM and Frank Williams. The deal with Migault was for five races: Monaco, France, Britain, Germany, and Austria. They also missed Monaco but seemed set for a debut in France. Peter Connew, Barry Doran and Barry Boor (Connew's cousin), the core of the team, hadn't thought of a transporter but a week before the race Migault came over driving an empty Ford truck. They sat out to convert it to a transporter, Boor even insulting his bride by marrying on Saturday and leaving by Sunday lunch to help the lads. After working all out until Tuesday morning, they caught some sleep and drove the transporter out to Southampton to catch the ferry. Boor remembers: "My bride saw me for less than 24 hours in our first fortnight of marriage. She never forgave me." Then disaster struck as the transporter terminally expired 60 miles north of Le Mans. With the race being run at Clermont-Ferrand, Connew persuaded Migault to give the race a miss and instead to concentrate on a bit of pre-race testing at the Le Mans Bugatti track. But already in the first lap it came to light that a rear wishbone had been bent during transportation. So it was back to the drawing board and some testing at Goodwood and Snetterton. Weeks later, in practice for the Austrian GP, a rival mechanic noticed the fuel system had been plumbed the wrong way around! The British GP finally saw the car's debut but the weekend was marred by all sorts of car trouble, such as uprights cracking under the strain. Migault managed a 1m 30.3sec, a full 3 seconds slower than Pescarolo's Williams March, the last car to line up on the grid. Another disappointment followed as the team was barred from the German GP, the team not having an entry. Migault did manage to barge his way through to the paddock where he persuaded the other teams to allow him to try and qualify. But the organizers would have nothing of it. By Austria the car had still not run more than 100 miles but here Migault did the impossible, welcomed by everyone in the paddock rooting for the little team. He caused some angry faces though, spraying oil over the track in his first qualifying attempt. But then, keeping the revs below 9600 rpm, he made the grid of a World Championship Grand Prix - a remarkable accomplishment in its own right, even if it was three seconds down on the rest of the field. Amazingly, in the race Migault was flying. The car picked up places and at one point was lying 17th, with four other cars behind it. Had it kept going it would probably have finished tenth, earning enough prize money to go to Monza. But on lap 22 a suspension pick-up broke, the car weaving across the straight to come to a halt undamaged. After receiving a generous cheque for £ 600 from John Webb the team paid its bills and packed up. The following year a Swiss amateur racer called Pierre Soukry converted the chassis to F5000 spec, putting his Chevy engine in the back. In Soukry's hands it didn't shine and with Tony Trimmer driving at Brands the car was knocked into a barrier, damaging the monocoque beyond repair. In the eighties Connew became a Jaguar and Daimler specialist, while Barry Boor still claims the Connew project was the best thing that happened to him in his life. The two chassis have found a place in Connew's backyard, covered with weeds. Roger Doran visited the garden in 1984 and remembers: "It was like looking at a piece of my life. There was a lot of me lying there."